Every two weeks, every cultivar is evaluated by Brandon Coker for "horticultural" performance. The performance ratings are based on number of flowers, leaf color, uniformity of habit and flower, resistance to insects and diseases and overall appearance. This allows us to follow the performance of each cultivar through "good times and bad." The data are combined into a single performance rating, based on a scale of 1-5, with 5 being exceptional, 1 being almost dead. The ratings are then used to generate a graph of performance over time, and are updated at every evaluation date. This allows a real time viewing of performance and more importantly, an in-depth understanding of how a plant performed from spring to fall. Most cultivars will be accompanied by a photo. These graphs can be found under annuals. Perennials All perennials remain in the garden for at least three years, however, since most plants are not established the first year, data generally begins after the first winter. The time of first flower, duration of flowering, height, foliar health and comments are provided as the plants mature throughout the season. Accompanying these data is a photograph of the flower and plant habit. These may be found under perennials. The Gardens at Athens are open year round. We hope you will visit. 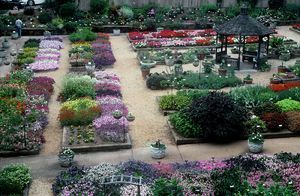 The Best of the Bunch For annuals, we also select the best cultivars for each color in each class of annuals (e.g. the best red begonia) and list them under 'Best of the Best' For both annuals and perennials, we also choose the recipients for the Classic City Award; the very best plants in the garden over the entire season, well worth a place in any landscape.